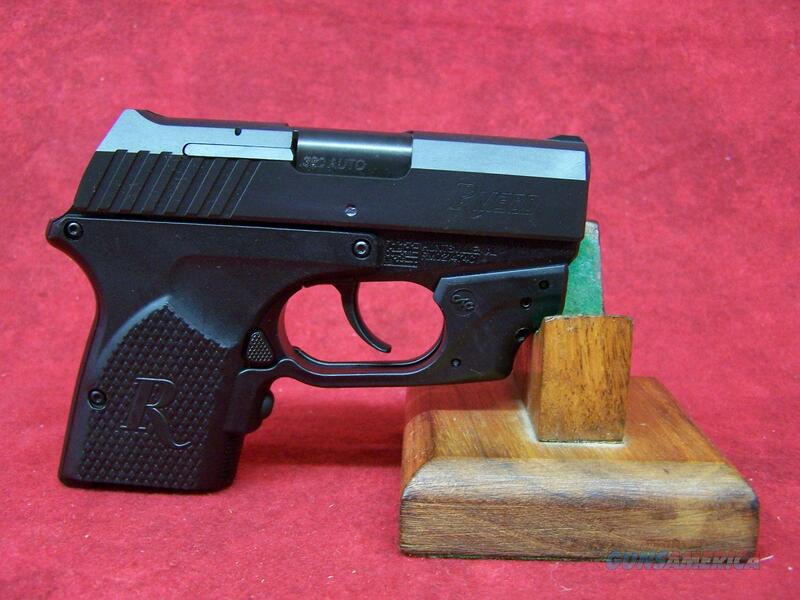 Remington Model RM380 With Crimson Trace Grip .380ACP 2.9 Inch Stainless Steel Barrel Black Oxide Finish Double Action Only Fixed Sights 6 Round Model RM380 All metal construction with a 7075 aluminum frame and a 410 stainless steel barrel. Precise barrel to slide lock-up for accuracy and precision. Long double action only trigger. Fully functional slide stop holds open on last round. Fully ambidextrous, low profile magazine release. Extended beavertail grip with replaceable grip panels. Checkered front strap and trigger guard undercut. Wide, positive cocking serrations. Fixed sights, contoured to be snag free. Light dual recoil spring system for easy slide racking. Trigger pull is ten pounds. Two 6+1 round magazines; one extended floor plate, one flush.